There is a saying that “Carpet doesn’t wear out, it uglies out”. Carpets are often replaced too soon, but this can easily be avoided. There are a few steps that can come in handy when trying to prolong the life of your carpet. Carpet can be tricky, and unfortunately, there is no room to learn from our mistakes when it comes to maintenance. That doesn’t mean that our attempts at keeping a carpet clean have to end in failure. It is important to be proactive when it comes to carpet care. Don’t wait for the rugs to become visibly dirty to clean them, which can be tough, since rugs are specifically designed to hide dirt. What this means is that when a carpet looks dirty, it is really dirty. One of the first things you must do when cleaning your carpet is check the specifications, so that you know what you’re dealing with and so that you don’t void your warranty. The next thing you need to do is find balance. More is not better, and too much product can exacerbate re-soiling, while oversaturating can cause things like mold and odors to develop in the carpet. Your goal should be to have a dry carpet within six hours. The closer you get to 24 hours, the bigger your risk of mold. 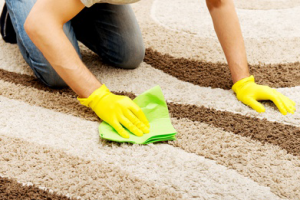 Keep in mind that it is easier to prevent a ruined carpet than it is to cure on. Good luck! Majestic Carpet Care can be found here!